Chile has elected a new conservative president, Sebastian Piñera, of the centre-right coalition. In March 2010 he will replace the highly popular Michelle Bachelet, of the left-leaning Christian Democratic Party (PDC), Chile’s first woman president. No sharp policy changes are expected under Piñera, as he has promised to continue the government’s social programs. Property prices have remained relatively stable during the recent global crisis – and rose, agents say, during the last quarter of 2009. This is difficult to verify, however, due to the lack of official or unofficial house price data. Transactions dropped by around 30% to 40% from 2008 to mid-2009, agents report. The number of dwellings authorized for construction dropped by 10.6% from January to November 2009 compared to the same period in 2008. In metropolitan regions, the drop was 43%. Nevertheless, Global Property Guide figures compiled in November 2009 show that the average price of apartments in Santiago jumped 20% to US$1,720 per sq. m. from US$1,438 a year earlier. Prices in other popular areas show higher price increases. 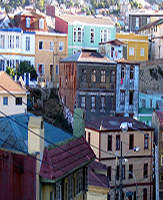 The average price surged by 48% in Valparaiso City (from US$637 to US$ 943 per sq. m.) and by 34% in Viña del Mar (from US$1,419 to US$ 1,899 per sq. m.), coastal cities in central Chile, near Santiago. OECD membership serves as a crowning glory to the accomplishments of the coalition led by centre-left Christian Democrat Party (PDC). After winning the elections in 1990, the PDC continued the economic reforms begun by Pinochet dictatorship, but with a social orientation, combining economic openness, market reform and social safety-nets. Chile experienced rapid economic growth, lower unemployment and the expansion of the middle-class. In the 2010 elections, the PDC became victims of their own success in growing the huge middle-class, which voted for billionaire Piñera. Chile’s GDP contracted by around 1.8% in 2009, after growing by 3.2% in 2008 and by an average of 5.2% from 2004 to 2007. Economic growth is expected to resume in 2010 with a 4% expansion. The population is greatly concentrated in the center region, also known as the Central Valley, where the capital Santiago is also located. Santiago is home to about 30% of Chileans and is densely populated. It is also visited by the most number of both local and foreign tourists in Chile. Chile bucked the trend of falling tourist arrivals in 2009, according to the United Nations World Tourism Organization (UNWTO). While international tourism declined by 4% according to the UNWTO, figures from National Statistics Institute (NIE) show a 2% to 3% growth in tourist arrivals. Growth in tourism supported strong rental yields. Chile has a small but competitive rental market. In November 2009, apartment rental yields in Santiago city was around 7.4% according to the Global Property Guide. However, these yields were slightly lower compared to the average of 8.2% in 2008. Rental yields in other areas are lower in 2009 at 5% in Valparaiso and 3.6% in Viña del Mar. The lower yields may be due to the stronger demand for ownership in coastal cities compared to the capital. Chile may seem to have enough land to house its 16 million people, but most arable land is concentrated, in the Central Valley. A housing shortage still exists in Chile, but has been reduced significantly through a very successful housing policy, while the owner-occupancy rate has been raised. The Ministry of Housing and Planning (Ministerio de Vivienda y Urbanismo or MINVU) was created in the 1970s, and it has dominated the housing sector since. It is the country’s largest real estate firm, and its second largest mortgage bank. These laws may explain the slightly lower yields in Santiago on 60 sq. mt. apartments (7.29%) and 120 sq. mt. apartments (8.87%), as noted in our yields research, which is contrary to the usual rule that smaller apartments have higher yields. In July 2006, President Bachelet announced the need to build 420,000 dwellings to provide larger houses for the poorest 40% of the population, giving them a minimum of two bedrooms. Since Bachelet took office in March 2006, 446,068 homes have been constructed, and either provided free to poor families, or subsidized for low to middle-income households. The number of dwellings completed annually under Bachelet’s term was among the highest in Chile’s history. In 2006, more than 163,000 homes were started, the decade’s highest number. In 2007 and 2008, housing starts reached almost 151,000. Construction activity slowed in 2009 and housing starts are likely to reach only 130,000. Another 250,000 families were given support to renovate their homes through another government program. Chile has one of the most developed mortgage market in Latin America. At around 20% of GDP in 2009 (up from 12%in 2002), it is also one of the largest in the region. Due to strong economic growth, macroeconomic stability and financial market reforms, the amount of outstanding housing loans grew by an average of 21% annually from 2004 to 2008. Although affected by the financial crisis, the mortgage market grew by around 7% in 2009 to CLP17.4 billion (US$35.25 million), as of November. Chile’s banks do not usually lend to foreigners, even to those with a resident’s permit. Banks employ strict lending criteria which are almost impossible for foreigners to satisfy. Tight control on mortgages may have reduced the country’s exposure to the global financial crisis. The average housing loan rate gradually fell from 7.5% in January 2002 to below 4% for most of 2004. From 2006 to 2008, it was relatively stable at around 5%. The average loan rate then shot up to 5.9% in January 2009 before falling to around 4.5% until the end of 2009. Low interest rates also facilitated the continuous growth of the mortgage market. The Central Bank has kept its benchmark interest rate low at 0.5% since July 2009 and expects the rate to be steady at least until Q2 2010. The Chilean economy is renowned for its track record of sustained growth. Between 1990 and 2007, it expanded at an annual average rate of 5.5%. Although the period included a contraction of 0.4% in 1999, it was still was among the highest growth rates in the world. Chile’s accession to the OECD highlighted the reduction of poverty from 45% in the late 1980s to around 14% in 2009. Advances in other aspects such as strengthening of state institutions and fighting corruption were also noted. Fiscal discipline is one of the pillars of Chile’s solid international image. Since 2000, the government has run a sustained budget surplus. Before the crisis struck, Chile had a fiscal surplus of 8.7% and 5% of GDP in 2007 and 2008, respectively. The budget surplus not only transformed Chile from a debtor to a creditor country, it also placed the country in solid position to weather global economic volatility. When Chile entered recession in 2009, the government was able to increase its spending by 16%, due partly to funds specially set-aside funds from sales of copper profits. A fiscal stimulus program worth around 2.4% of GDP was implemented. Although the fiscal balance registered a deficit of 5% of GDP, a return to balance is expected in 2010 and a surplus in 2011. Economic growth at around 4% annually is expected in 2010 and 2011. This is one of the best economic performances in the region. One of Chile’s perennial problems is its high unemployment rate, mainly due to restrictive and complicated labor laws combined with relatively generous social benefits. Since 1990, the lowest unemployment rate was around 6% (in 1997 – 1998). As of October 2009, unemployment stood at 9.8%, according to INE. The high unemployment rate may have contributed to the loss of the administration candidate in the presidential election.